Remember the fall that broke the internet? Good old Robert Mugabe has this thing where he hates to admit weaknesses, thus always putting up the front that he is a strong man when his 91st birthday is just around the corner. Since that fall, which transformed into several memes from the unforgiving internet; the government has been in overdrive spinning the incident. Information minister Jonathan Moyo told Zimbabwe’s Herald, that the ‘alleged’ fall occurred because two pieces of carpet that had not been properly laid, forming a hump. Personally, I feel the guy who walked on water would have a little more poise than a nonagenarian. Still, the government in Harare doesn’t look like they are done handling this incident. A report from South Africa’s Times indicates 27of his personal guards have been suspended as an official investigation is carried out. The feeling is that they were a little too slack on the job, and it seems more heads would roll before all is said and done. 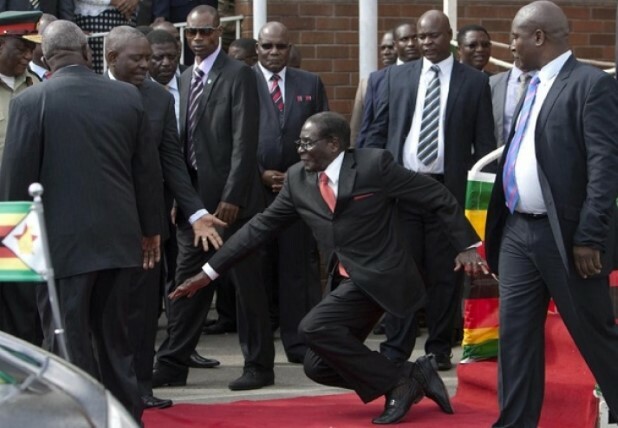 It looks to me like one requires superhuman reflex skills to work for Mugabe, as that’s the only way anyone could have anticipated and stopped that fall. Still, he wouldn’t be the Mugabe we all know and love if he did not frequently carry out such antics. Really? is it their fault that he is old and he isnt as energetic as he used to be?